Glenavon manager Gary Hamilton added one fresh face to his squad this week - and moved to ease fears over multiple players heading for the Mourneview Park exit door. Marc Griffin, a striker with extensive League of Ireland experience, signed on for next season having impressed Glenavon during the pre-season friendly period. He will join summer signings Andrew Mitchell and Adam Foley in bolstering the club’s selection options. Hamilton has confirmed plans to continue to strengthen the squad over the transfer window plus offered clarification on the future of some current players following speculation over potential departures by Gregg Moorhouse, Joel Cooper and Aaron Canning. “Gregg has been invited over to Coventry City with the blessing of the club and impressed to the point they have asked him to travel to Spain on a pre-season trip,” said Hamilton. “As a club, we never stand in the way of a player making progress on his career and obviously full-time football would present a great opportunity for Gregg. “Gregg is still under contract to the club but at this point it is still just a case of Coventry having a look at the player rather than any transfer negotiations. “Joel has been offered a scholarship in America which would not only focus on football but give him the chance at earning a degree. 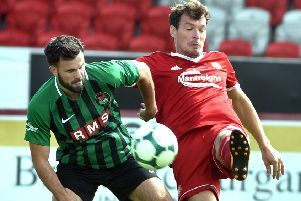 “We understand part-time football in the Irish League is a career but this is a chance at building his long-term prospects so, again, we would never stop someone moving forward. “With Gregg and Joel it is a case at the minute of keeping in touch with the players and an eye on the situation but both remain contracted to the club and nothing has been finalised in either case. Glenavon will host a Crystal Palace development squad at Mourneview Park on Monday from 7.45, with admission £8 and £5 (concession).